Fibaro Double On/Off Relay Switch is designed to be installed in standard wall-switch, or anywhere else where it is necessary to operate two independent devices of up to 1.5kW each. 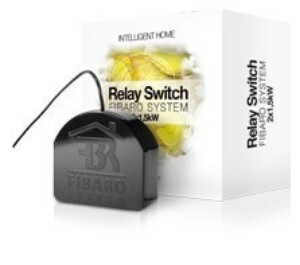 Fibaro Double On/Off Relay Switch can switch on or off connected devices either through z-wave or through the local wall switch connected directly to it. Easily transform your existing light switch to an automated one or use it to control other electric appliances like pumps, motor, sprinklers etc . This is a 3 wire device requiring a live and neutral connection. The switching relay contacts are isolated so it can also be used to switch low voltage DC circuits. Both relays share a common input terminal so both loads must operate on the same supply whether AC or DC. Its compact size means that it can be fitted inside wall boxes if there is sufficient depth or it can located anywhere between the switch and load.